Or call us on 01691 679900 for more information. This is the new BrainBee Wireless Scan Tool, specifically for managing, qualifying and maintaining sensor valves on vehicle Tyre Pressure Monitoring Systems. Created by the “Self-diagnosis Specialists”, B-TP 1000 aims to simplify garage work and enable the car repairer to immediately solve the problem he is faced with. Practical and easy to handle, with the support of its vast DATABASE, it is extremely powerful and complete, enabling the repairer to work simply and effectively on original equipment valves and on universal valves (programmable). the instrument turns on in five seconds and is operative on the car in less than thirty. B-TP 1000 proves indispensable every time you have to operate on TPMS (obligatory on all European registrations as of November 2014 for the purposes of EUROPEAN REGULATION 523/212). 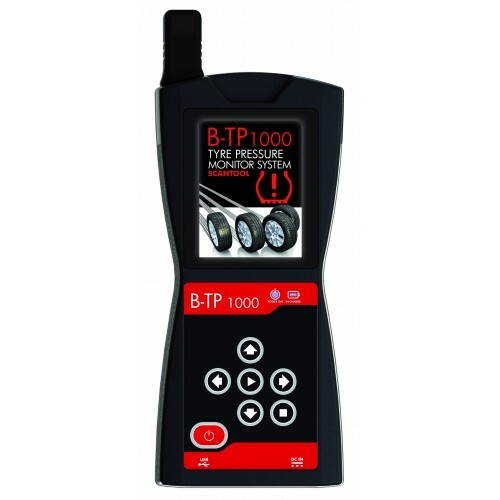 Operations, which range from simple seasonal tyre changes, in which it is necessary to record the tyre position and proceed to set up the control unit, to the identification the system's faults and their repair, entail complex electronic management that B-TP 1000 is able to resolve in a few minutes. The Valve Pressure/Temperature/Battery Voltage values are read, enabling the repairer to diagnose the functioning of the valves themselves. On replacing a damaged or simply worn valve (low battery) replacement with an original does not include any particular activity provided it is already programmed with the right code. It would however require a large amount of valves to be kept in stock. So, there are "virgin" universal valves on the market that can be used once programmed with the right code. In the UNIVERSAL VALVE PROGRAMMING PHASE the Type of car – code (obtained from the Database) and the serial number (read from the replaced valve) are written inside the valve. So the database and its updating prove indispensable in order to use the instrument correctly and take advantage of all its potential.